“Let’s work by consensus!” is a familiar rallying cry. It feels egalitarian, generative and worthy. So we set aside Robert’s Rules of Order and begin a dialogue where all are encouraged to weigh in. We promise ourselves that we won’t move forward until we’ve reached an agreement that everyone likes. And then the problems begin, because we have confused consensus with unanimity. In contrast, unanimity is undivided opinion. Everyone is in agreement on the best course of action to take. The difference is subtle but important. When we strive for unanimity, we end up taking an inordinate amount of time to make decisions. At best, innovation grinds to a halt. At worst, we create unhealthy patterns of interaction where people are pressured to acquiesce on important issues. Case in Point: They were known within the congregation as the dream team, nine respected leaders with rich life experience, assembled to identify and recruit the next pastoral leader of the congregation. The team members were individually accomplished, insightful and wise. Their first motion was to work by consensus. They interpreted this to mean that they would not recommend any candidate to the congregation unless they were all in agreement about their first choice. The dream team worked diligently at their task for eighteen long months. Then they polarized around three potential candidates. Sub-groups began meeting informally between meetings to decide how they would posture themselves in the full team meeting. Each group had become highly invested in promoting their candidate and “protecting the church” from the other candidates. They were locked in opposition and it did not appear that they were going to accomplish the basic task to which they had been appointed. What caused nine healthy leaders to become so dysfunctional? Their decision making rested on the assumption that when the right candidate came along, the team would unanimously recognize that person as their first choice. They confused consensus and unanimity. Consensus is not the same thing as a unanimous decision, in which all group members’ personal preferences are satisfied. Consensus is also not a majority vote, in which some larger segment of the group gets to make the decision. Consensus is not a coercive or manipulative tactic to get members to conform to some preordained decision. In testing for consensus you are not asking: Is this your first choice of options? Do you like this option? Does this option satisfy your personal needs? In testing for consensus you are asking: Is this an option that I can live with and ultimately support? Does this option satisfy the criteria that we have claimed as a group? 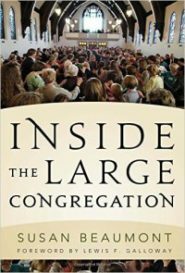 Will this option adequately serve the best interest of our congregation and its stakeholders? Simply agreeing with a decision is not true consensus. Consensus implies commitment to the decision, which means that you oblige yourself to do your part in putting the decision into action. How Do We Work with Disagreement? Each group member has the right and responsibility to express concerns. Legitimate concerns will take the form of questions and statements about the option that might not serve the congregation’s best interests. As concerns are raised, the group seeks to understand and attempt to resolve them. We listen fully to the reservation that has been raised. We ask open-ended questions to better understand the reservation. We provide additional information to the person raising the concern. We pause regularly for silence and prayer to discern the movement of Spirit. When listening and clarification don’t resolve the expressed concern, we have several options available to us. We can offer to make the concern a point of record, so that the person with reservation can support the initiative of the whole without abandoning their personal integrity. The individual with reservations can also agree to “stand aside”, which is to say that their concern has been appropriately vetted, and the individual is willing to let the group move ahead in spite of the reservation. This also means that the concerned individual will support the decision outside of the decision making room. Sometimes the reservations expressed in decision making are non-legitimate or obstructive. A non-legitimate concern occurs when the person who disagrees is acting at odds with what is in the best interest of the congregation, often pursing personal values, beliefs or needs. 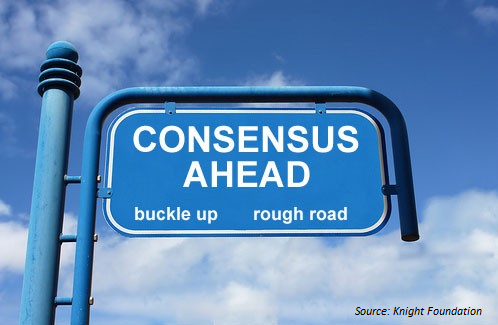 What Happens if We Can’t Reach Consensus? Defer the decision. Go back to the drawing board. Consider a new pool of options. Dissolve the group. Acknowledge that this group is probably not able to reach consensus and form a new group to take over. Give decision making authority to a sub-group. You may decide in advance that unresolved issues will be delegated to a smaller sub-set of decision makers. Default to a majority vote. The group can decide, in advance, on a point in time where consensus seeking will end. If you have not reached consensus by that point in time, the group will vote and the decision will be determined by the majority. Consensus is not mere acquiescence. It is a healthy and cooperative form of dialogue that invites truth-telling, authentic listening and accountability. It invites group members to move into the future, passionately committed to the decisions they have made.